Synthetic lab created diamonds offer an eco-friendly and ethical alternative to wedding rings and engagement rings made with real diamonds. Plus, these types of lab grown diamonds have the exact same physical characteristics as real natural diamonds. 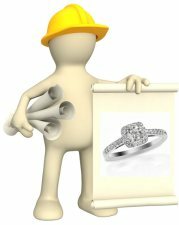 To find out more about synthetic diamonds, also known as HPHT or CVD diamonds, including pros and cons of lab grown diamonds, averages prices, comparisons to natural diamonds and essential shopping tips, check out the helpful info below. Synthetic diamonds are indistinguishable from natural diamonds. 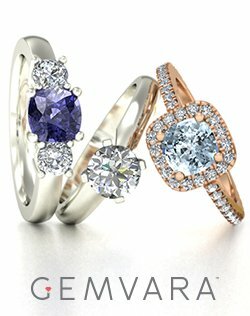 Fancy color synthetic diamonds are much less expensive than natural fancy color diamonds. The process that is used to make most synthetic diamonds is known as HPHT - High Pressure High Temperature. 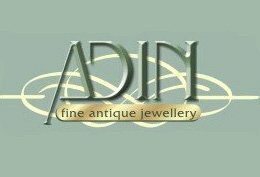 And if you have any questions about lab created diamonds, or you would like to send in comments, reviews or pics of your stunning synthetic diamond ring, just use the handy comment box at the end of the page! Simulant diamonds look like real diamonds but have different physical properties than natural diamonds. Examples of simulant diamonds include cubic zirconia, moissanite and white sapphire. Synthetic diamonds have the exact same physical and molecular properties as natural diamonds - the only difference between lab diamonds and natural diamonds is that they were created in a lab. Examples of synthetic diamonds include HPHT diamonds and CVD diamonds. Unfortunately, even though there is a clear difference between simulants and synthetics - simulants are sometimes sold as synthetics. 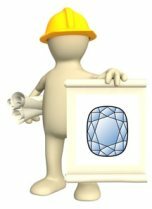 If you are searching for a real synthetic lab created diamond, use the shopping tips and recommendations below to make sure the diamonds are true synthetics. Laboratory created synthetic diamonds are made through two methods: HPHT and CVD. High-Pressure High-Temperature synthesis is the most common method which is used to manufacture lab created diamonds because it is more affordable than CVD. 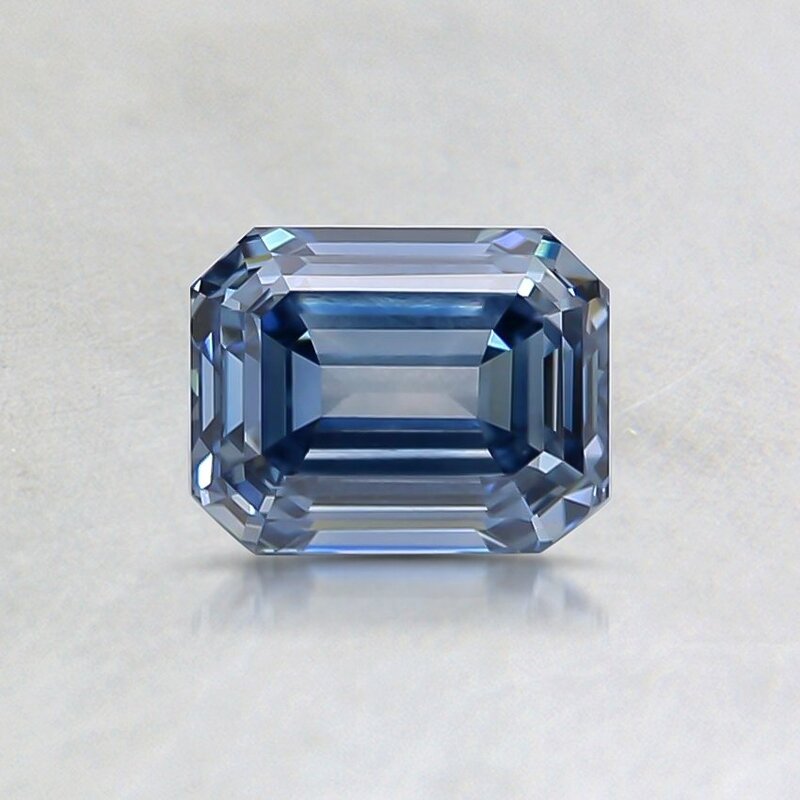 The process mimics the natural conditions which result in natural diamond formation – and uses a small synthetic diamond ‘seed’ coupled with a carbon source to create colorless and fancy color diamond synthetics. Chemical Vapor Deposition synthesis creates lab grown diamonds from a hydrocarbon gas source. During this process, the carbon rich gas is fed into a chamber and then exposed to increased temperatures and a power source (like a microwave, laser or electronic beam) that forces the carbon particles to align into a crystalline diamond structure. CVD can be used to grow diamonds used in synthetic diamond rings, but it is used more often for technological purposes – like creating diamond tipped lasers and tools. HPHT and CVD produce the same type and same quality of synthetic diamonds – and just like real diamonds, HPHT and CVD diamonds must be cut and polished once they are produced. How do synthetic lab grown diamonds compare to real diamonds – they are virtually one and the same. Here is a table comparing HPHT and CVD diamonds to real diamonds. (If you would like to see how synthetic diamonds compare to diamond simulants, check out the table on our man-made diamonds page). The only difference between natural diamonds and synthetic diamonds are that synthetic diamonds contain practically no flaws - which is exceedingly rare in natural diamonds. 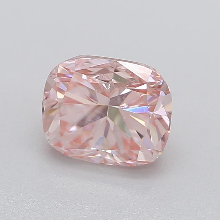 Colorless synthetic diamonds are virtually colorless too with very little to no color tint, which is also an extremely rare quality in natural diamonds. 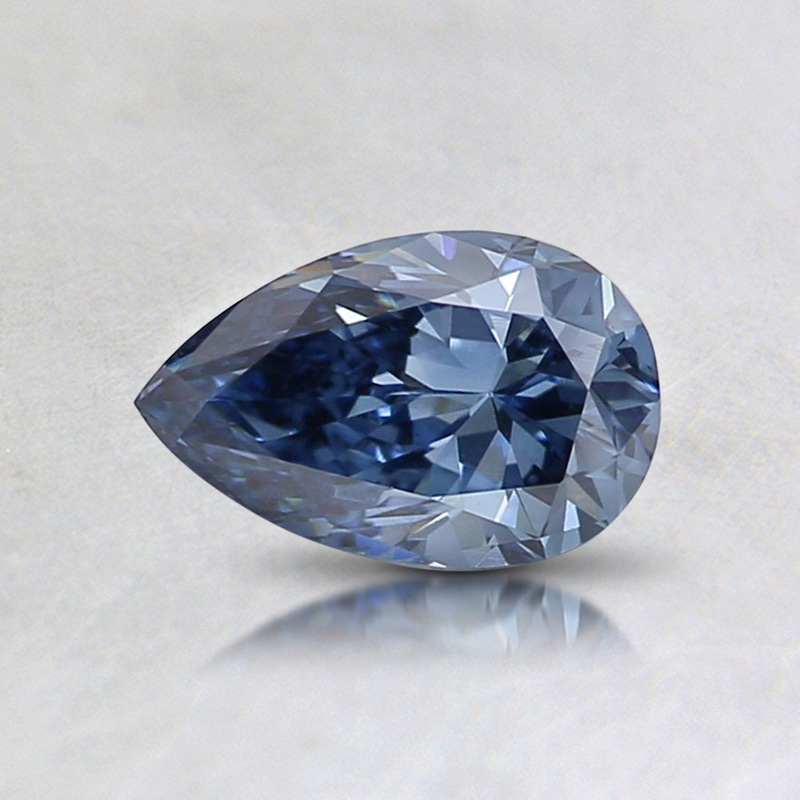 HPHT and CVD diamonds can also be harder than even real diamonds because they are almost completely flawless. The imperfections in real diamonds, outer and inner imperfections known as blemishes and inclusions, can have a minute impact on the hardness of the stones. And a natural diamond with a poor clarity rating can have increased risks for breaking and chipping. 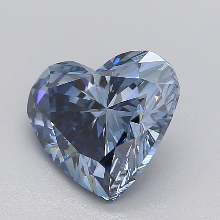 But as HPHT and CVD diamonds are often produced with very little amounts of inclusions or blemishes, their higher clarity equals to improved strength and durability. Availability. 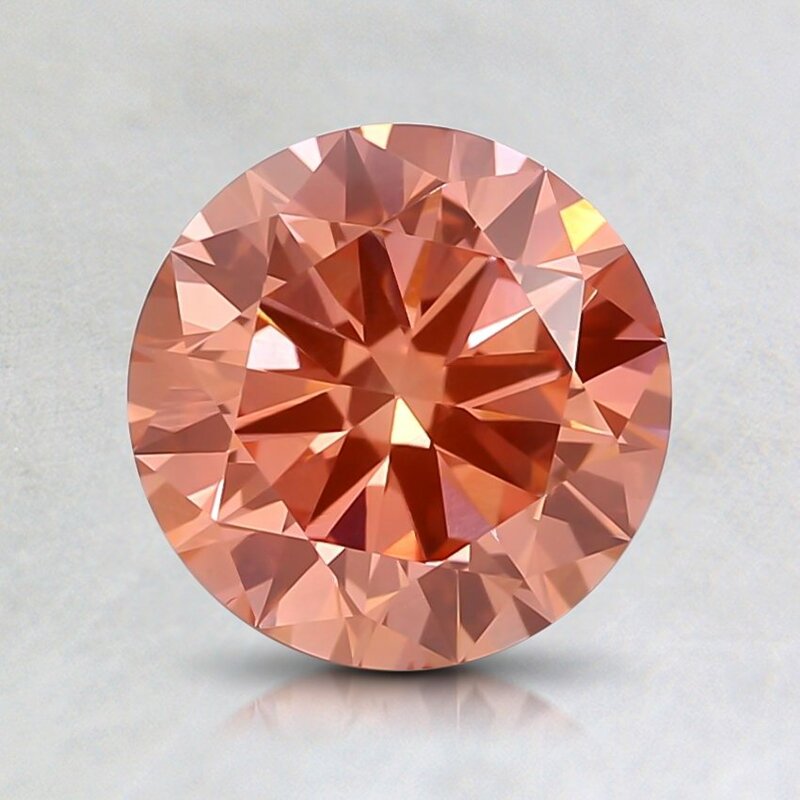 In addition to colorless (white) diamonds, fancy colored synthetic diamonds are available in a huge variety of colors including canary yellow, orange, cognac, green, blue, pink and red. 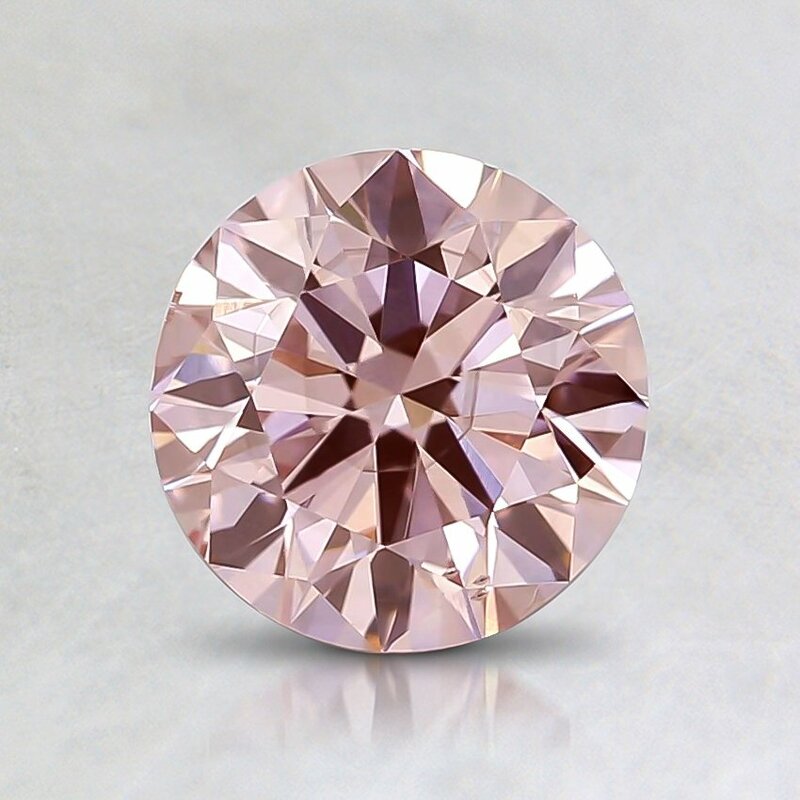 Natural fancy colored diamonds are quite rare and extremely expensive - unlike their synthetic counterparts. Styles. Synthetic diamonds are also available in a large selection of cuts and shapes, and it is possible to buy synthetic diamonds already fashioned into synthetic diamond rings. 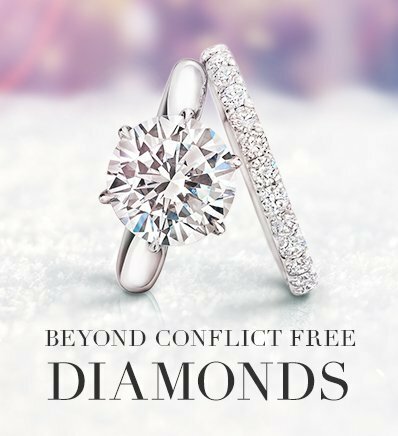 100% Conflict Free: Synthetic diamonds are 100% conflict free! It is estimated that up to 15% of the diamonds sold today could be considered 'blood diamonds' - selecting synthetic diamonds is one way to make sure that your diamonds are 100% ethical. Colorless synthetic man made diamonds are the most expensive to grow – they take the longest period of time to synthesize and only a few laboratories in the world have the time and equipment needed to grow them. 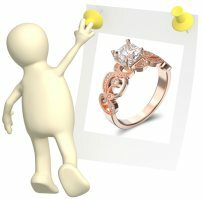 A colorless synthetic diamond is on average priced a bit higher than a colorless natural diamond – but if you want to be sure that you are buying a 100% eco-friendly and conflict free diamond ring, a colorless synthetic diamond engagement ring is a great alternative to natural colorless diamonds. 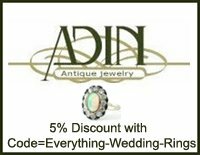 If your heart is set on a colorless diamond engagement ring but you are on a tight budget, you may want to consider a ring made with diamond simulants - like white sapphire, moissanite or cubic zirconia – instead of diamond synthetics. The other con associated with lab grown diamonds is size. Most fancy color synthetic diamonds are only available in sizes up to 2 carats, and 1 carat is usually the largest size synthetic colorless diamonds are available in. If you are looking for a ring with plenty of captivating carat bling, you may want to look for natural or synthetic gemstones which are available in larger carat sizes – or opt for a ring made with 2 or 3 synthetic diamonds in the center instead of a solitaire style. 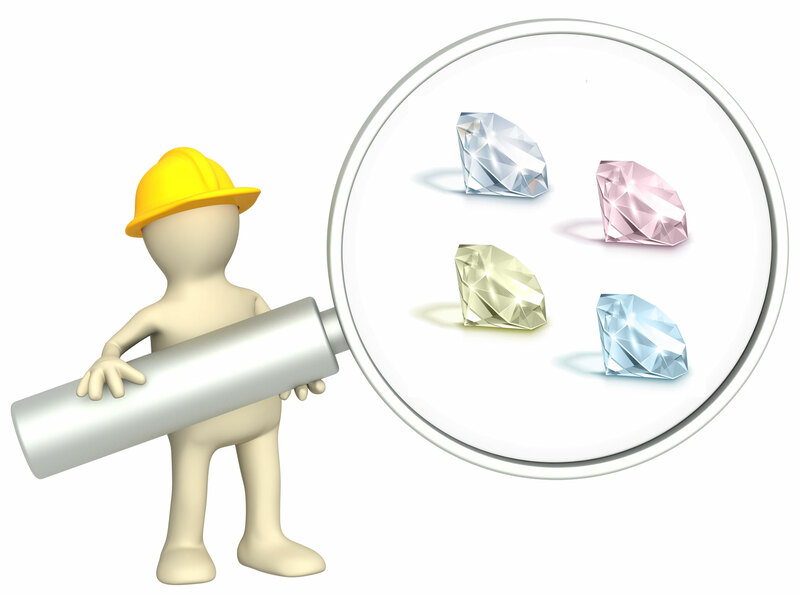 Below you will find the average price for 0.5 carat loose synthetic lab created diamonds vs natural diamonds with comparable clarity, cut and color characteristics. Prices for synthetic and natural diamonds will vary according to cut, color, carat and clarity – but as you can see from the table, you can save a huge amount of money with the purchase of a synthetic fancy color diamond as opposed to a natural fancy color diamond. 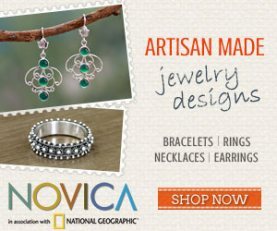 Stick with companies which sell synthetic lab created diamonds that come with a certificate from a reputable laboratory like the GIA. 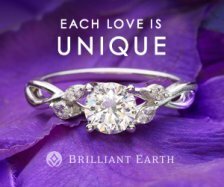 Our number one recommendation where you can buy, and look for a large selection of GIA certified synthetic diamonds is Brilliant Earth. The certificate will confirm that your diamond is indeed a synthetic diamond – and not a simulant – and it will provide a grade on the diamond's clarity, cut, polish and color. 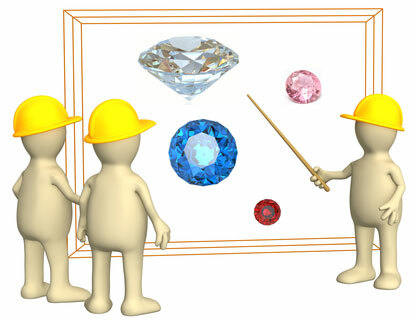 The certificate will also map out the diamond, which will come in handy if the diamond is ever lost or stolen. 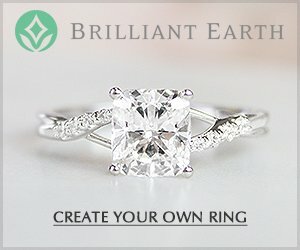 Always double check that you are definitely purchasing lab grown diamonds which have the exact same characteristics as natural diamonds. While these diamonds are almost always called ‘synthetic’ or ‘created’ diamonds, some retailers may also use these terms for simulant diamonds. 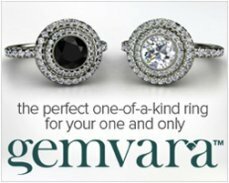 (Remember: simulant diamonds look similar to real diamonds but do not have the same chemical/physical characteristics as natural diamonds). Price is a terrific indicator of whether or not a synthetic diamond is truly a synthetic. If you see a synthetic diamond for sale for a too good to believe price, chances are this diamond is really just a simulant. Reputable synthetic diamond producers laser inscribe each of their diamonds with a microscopic serial number – which identifies the diamond as a lab produced synthetic diamond. If you see a synthetic diamond for sale without a laser inscribed number beware – you could be purchasing a cheap imitation. 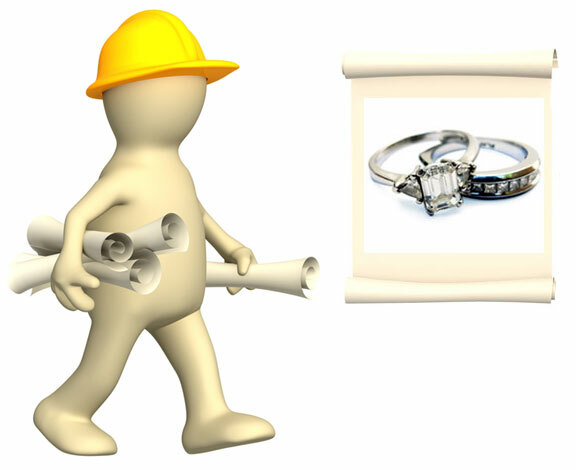 Lab grown diamonds may either be purchased loose, or fashioned into synthetic diamond rings. 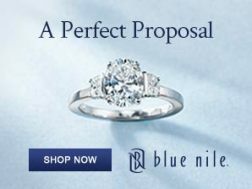 If you buy the diamonds loose, you can work with a local jeweler to design a custom handmade ring. For a synthetic diamond engagement ring or wedding band, stick with companies that use eco-friendly metals too, to ensure that the environmentally friendly aspect of the synthetic diamonds are not lost. Do you have comments or questions about synthetic lab created diamonds? 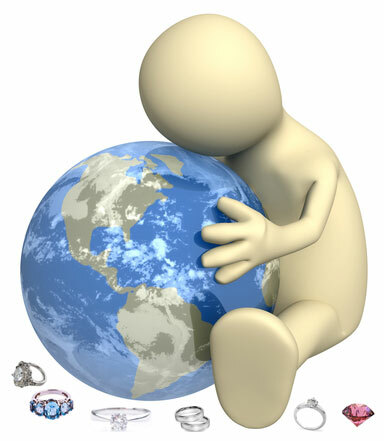 Send in your questions and comments, or upload pics of your synthetic diamonds or created diamond rings to share here! See What You Can Expect From Cushion Cut Diamond Engagement Rings Here! 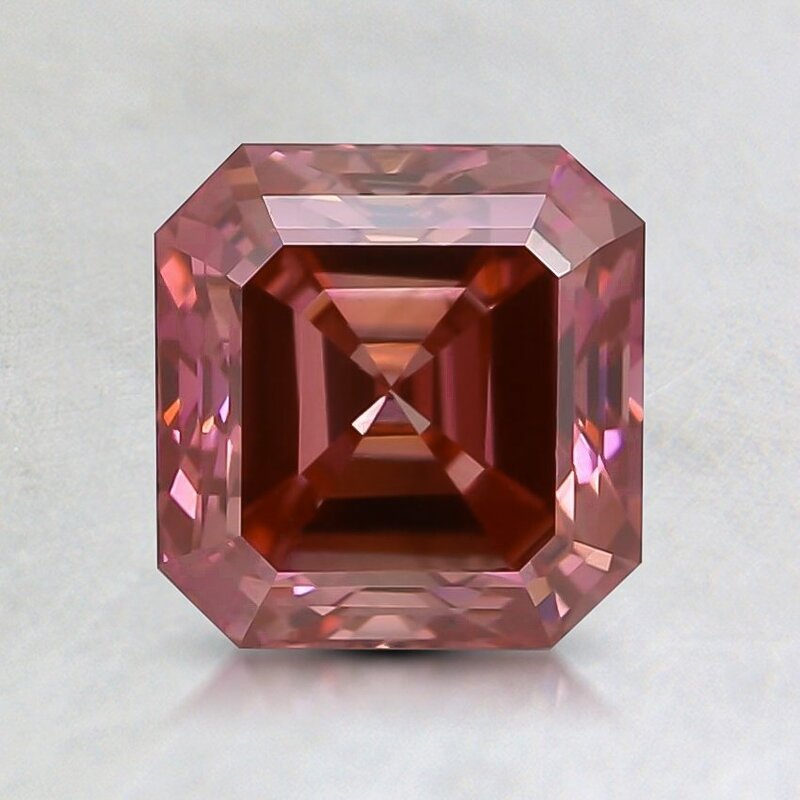 Examples of Synthetic Fancy Colored Lab Diamonds available at Brilliant Earth - to see the full current selection of colored fancies click on the link!